Tile removal can be a very difficult, dirty, hazardous job. 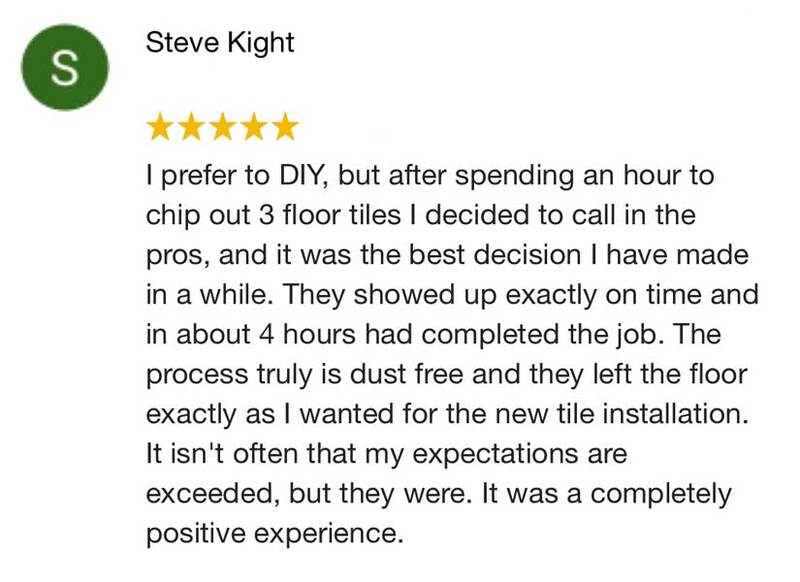 Central Florida Dust-Free Tile Removal has a solution that is Easy, Safe, Dustless and Fast! By clicking the “Get a free phone estimate” button above, I agree that a Central Florida Dust-Free Tile Removal specialist may contact me at the phone number provided by me and consent is not required to make a purchase. Χ It’s a difficult job – it’s not easy to break apart ceramic tiles and thinset. Χ It’s very messy – dust and gravel can make for a HUGE clean-up job. Fine, airborne silica dust will settle everywhere. You’ll never be able to clean it all up. Χ It can cause injury – razor sharp shards of ceramic tile can cause serious injuries & blindness. Χ It can be disabling or deadly – especially if you have allergies or asthma. Even if you’re healthy, the dust can cause disabling lung illness or death! Even if you have the proper tools to do the job, it won’t be a walk in the park. The proper tools are expensive and they still leave you facing a big, messy job. The thinset can be difficult to remove. Even if you can remove it, the resulting surface will be rough and uneven. That’s not a good surface to apply new flooring to. Will make a huge mess! Without our dust-free tile removal system, tile removal is a very dirty, dusty job! You would be surprised by the resulting amount of broken tile and thinset. Fine gravel, dirt and dust is always a by-product of tile demolition. 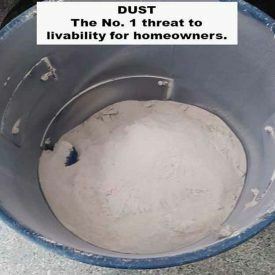 Fine silica dust will become airborne, spread throughout your home and settle everywhere. You’ll never be able to clean it all up! Can result in serious injury! Ceramic tile has some similarities to glass. Tile tends to break into sharp pieces similar to razor-sharp shards of glass. When these sharp pieces become projectiles, they can cause serious injuries. Injuries are likely to occur. Eye injury can result in blindness. 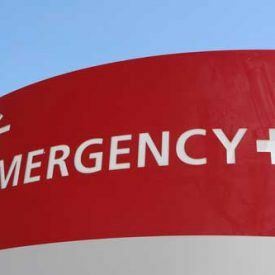 Professionals use special gear to avoid a medical emergency. Can cause permanent health problems! 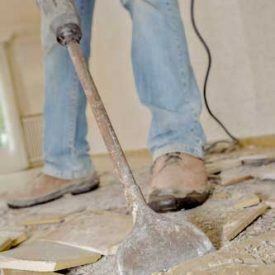 Tile demolition can produce lots of airborne silica dust. The airborne dust can spread throughout your home. Inhaled silica dust can cause an asthma attack in people with allergies and lead to silicosis. 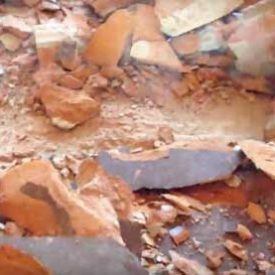 The U. S. Department of Labor produced a video explaining the danger of silicosis. Watch the video, “Stop Silicosis” here. The process of tile removal produces silica dust. According to OSHA, silica dust is a serious health danger. 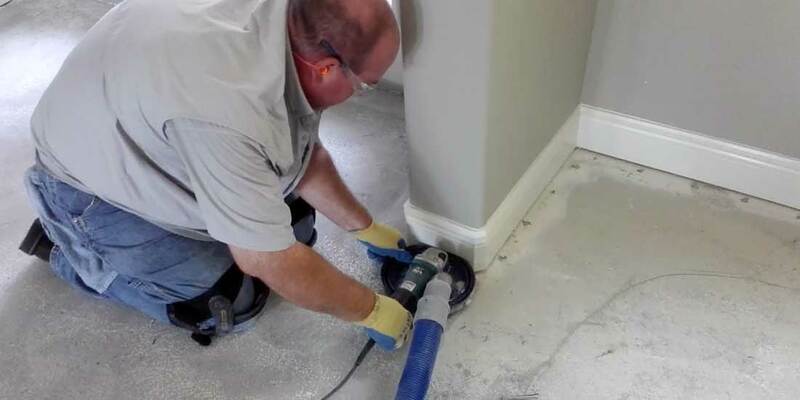 During tile demolition, silica dust can become airborne and spread throughout your home, leaving a coating of silica dust on furniture, beds, counters, floors – everything in your home. You’ll spend hours… probably days… cleaning your home – and never get it all. The dust can cause an asthma attack in people with allergies. Worse, silica dust can cause silicosis, a irreversible and disabling disease. Silicosis can eventually lead to breathing difficulty, heart failure and cancer. ⇒ Leave the job to professionals with proper equipment and experience! ⇒ Accept nothing but a company using the safe, clean, patented DustRam® system with HEPA filtration. ⇒ Choose a business with proper licensing and insurance. ⇒ Deal with a locally-owned and operated business that can provide great, personalized service. ⇒ Read online reviews left by customers who have dealt with the business. 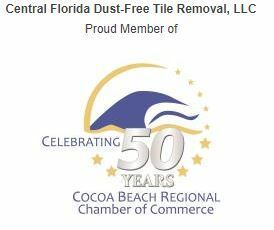 ⇒ Choose Central Florida Dust-Free Tile Removal LLC. 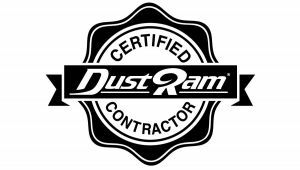 We are proud to be a certified DustRam® contractor. DustRam® is a patented tile removal system that uses HEPA filtration to make a fast, clean process. We use the patented DustRam® system along with our own special processes for clean, fast, dustless tile removal. Do you live in a condominium? We are condo specialists! Our process is so clean and fast, you can live in your home while we remove your flooring! Watch our process using the patented DustRam® system.